Climatrol serves the residential and commercial furnace sales and service needs of our customers in Clarksburg, West Virginia, and the surrounding area. We are professionally licensed furnace service contractors who have been proudly serving our region since 1969. Climatrol’s technicians have the equipment, the tools, and the experience to ensure that your equipment runs smoothly and reliably all year long. We are available to serve your comprehensive furnace installation, repair, and maintenance needs with the prompt, courteous response that you expect from Climatrol. Our factory-authorized installation ensures that you will be able to utilize your York or Lennox warranty. Do not be mislead by others who offer you a lower price, only to discover later that your installation was performed incorrectly, and your warranty was never valid. We offer gas, oil, and electric furnace installation for our valued customers throughout our service area. Climatrol is proud to offer you superior, energy-efficient furnaces from Lennox and York. We are also available to perform routine maintenance, repairs, and emergency service for ALL major brands, makes, and models of furnaces. Service agreements are also available to help you further reduce your operating costs and extend the life of your heating system in Bridgeport, and throughout our entire West Virginia service area. Our sales team is available to meet with you at your home or business to assist you with selecting the perfect unit to help ensure that you are comfortable throughout the seasons, while spending as little as possible on your energy expenses. While most of our customers choose to install gas furnaces, oil and electric furnaces remain popular options, and also offer many benefits that our customers appreciate. Our consultations and quotes are complimentary, so you have nothing to lose except the large financial drain on your bank account from continuing to operate your inefficient equipment. Our goal is to help you learn more about how easy it can be to dramatically increase the comfort of your business or home year-round. 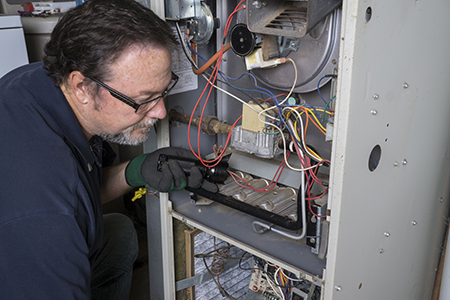 Replace Your Aging Furnace and Save Big on Your Heating Bills! With energy-efficiency ratings now routinely exceeding 95% (and approaching 100% on many models), it is worth considering a furnace replacement if your existing unit is aging. You can save big on your heating bills with a furnace upgrade. For example, many furnaces that are over ten years old have efficiency ratings of about 60%. What this means for you is that .40 cents of every dollar that you are spending to heat your home or business is being lost. Contact us to learn more about how we can help you take advantage of the exceptional advances in energy-efficiency that have taken place in the furnace industry. Call Climatrol at: (304) 623-0606.